This is one of the assignments for TMVG2 where we simulate working in a real design company. This module we all got allot of assignments to make and also special deadlines. 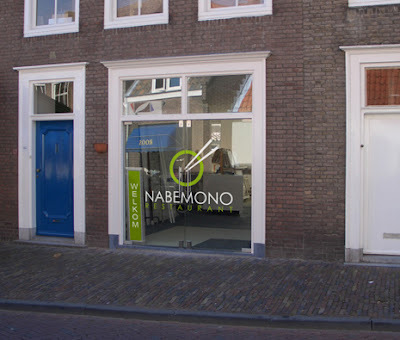 This assignment I had to make a logo for Nabemono a Japanese restaurant that is based in London and want to open a new root in the Netherlands. These are the sketches for the logo. However I wanted to make a clean logo, and not a logo that is easy to represent an Asian restaurant. I knew allot of other groups would use Asian styled logo/ fonts which is very simple and not very creative. I tried few logo with the name in Chinese letters which means, however these logo wont work in countries where people can't read it. So I went over to do designs with the chopsticks and bowls. Also some who knew what Japanese restaurants sell made sushi logo's, but Nabemono is a soup based fondue which have no sushi. And these are the design for the binder, business card and a mini DVD cover. 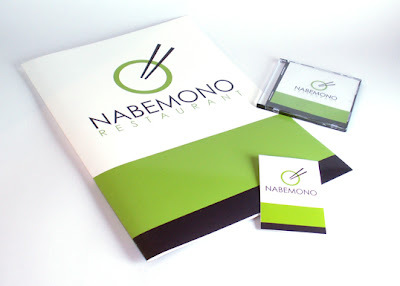 I kept the design clean and simple that give the restaurant a fresh and modern look. And here is the logo on the door of the restaurant. Here I needed to photoshop the logo so it looks like its pasted on the door.